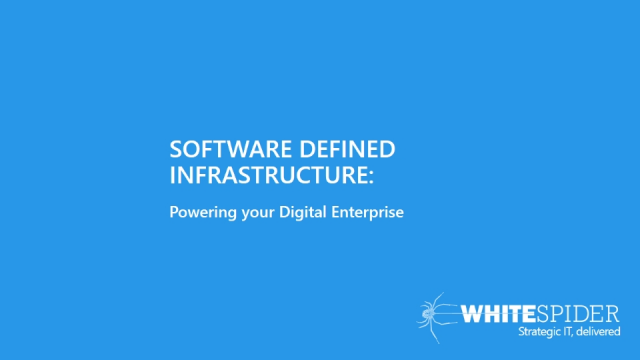 WhiteSpider will be hosting monthly webinars in partnership with leading technology vendors, giving insights into the benefits of building your own enterprise cloud. To create greater competitive advantage and better customer experience, organisations need to build their digital capabilities with innovative solutions and initiatives. 1. Enabling Scalability and Agility: Be able to rapidly scale, and react quickly to the changes in business requirements. 3. Developing automation: Solutions that enable orchestration and automation reducing the need for, and cost of, human intervention. 4. Promoting collaboration: Simplifying and unifying the communication between IT and Business. We will be looking at specific examples of where WhiteSpider has enabled these capabilities through solutions we have delivered in Motor Racing, Healthcare and Manufacturing. Almost all enterprises use a blend of public cloud and enterprise data centre applications. This webinar looks at how such enterprises can simplify and control the connectivity to the Hybrid Cloud and Public Cloud, whilst dramatically reducing costs and enabling scalability. The Heart of Your Enterprise Cloud: Nutanix hyperconverged infrastructure. In this webinar, we will give you insights into how enterprises can leverage Nutanix, the industry leading hyperconverged solution, to create an on-premise cloud infrastructure that delivers the simplicity and scalability of public clouds, but with the controllability and security of traditional data centre solutions.